It is has five double bedrooms all with independent access, bed king size bed, and equipped with everything, including air conditioning and TV, also, two rooms have a private bathroom, with spacious showers and spacious. 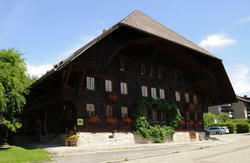 The Emme Lodge is one of these farmhouses built in 1768 just on the outskirts of the village. The Hostel is only 10 minutes from the station and the town of Langnau and is located in a quiet neighborhood. The hostel offers you a large communal kitchen, dining rooms and cozy game room with billiards, wireless and table soccer. The bedrooms are in the former maids and servants rooms. Shared bathroooms, bed linen and breakfast is included in the price.